Baby Boomers come of age… in 2017, 50 percent of the U.S. population is aged 50+. Obviously, the demographics and branding strategy for our aging population services are changing dramatically. People are living longer and having much more active lives. Methods and devices to receive information are also changing. This growing sector, combined with a very challenging economy, is putting greater pressure on many community services. Nobody likes the effects of aging, and the Berks County Senior Citizens Council realized its own nonprofit message needed more than just a face-lift. CrossRoads Studios was asked to conduct a strategic brand analysis since much of the community didn’t know their organization or what services they provided. Overall, there was a need to reposition the Berks County Senior Citizens Council around its existing equities to become more relevant to their future customers without alienating their existing customer base. Re-positioning the branding message also needed to differentiate and strengthen their brand message within a much larger, donor community. Our research discovered the emergence of a national trend. The word “encore” was emerging as a term being directed toward senior citizen activities such as continuing education, volunteering and even new career paths. 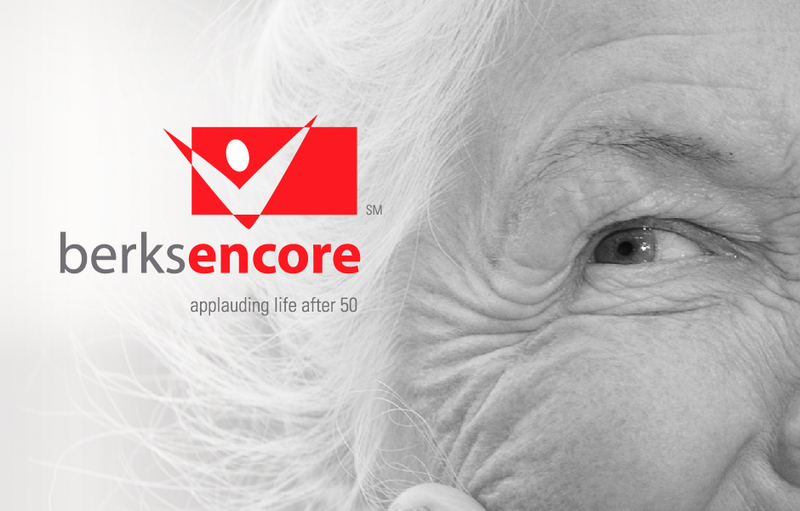 In essence, “encore” was being associated with vibrant seniors who continue to make positive contributions within their community. With this knowledge, CrossRoads Studios developed the dynamic “Berks Encore” brand name and message to help define the nonprofit’s goals and reach its target audiences. This included a vibrant new logo and the essence statement, “Applauding Life After 50″ (yes, 50 is the senior emergence). CrossRoads Studios also created a method to help clarify Berks Encore’s support from the United Way, Berks County Office of Aging and community donors by adding a statement to honor them on all print materials. CrossRoads Studios created a new “bealive” campaign for Berks Encore. This was targeted at different dynamic demographics and encompassed such statements as beloved, befit, becreative, beyourself, beinspirational, etc. The campaign was incorporated into the website redesign, focusing on the look and feel throughout. The responsive website works across multiple devices. 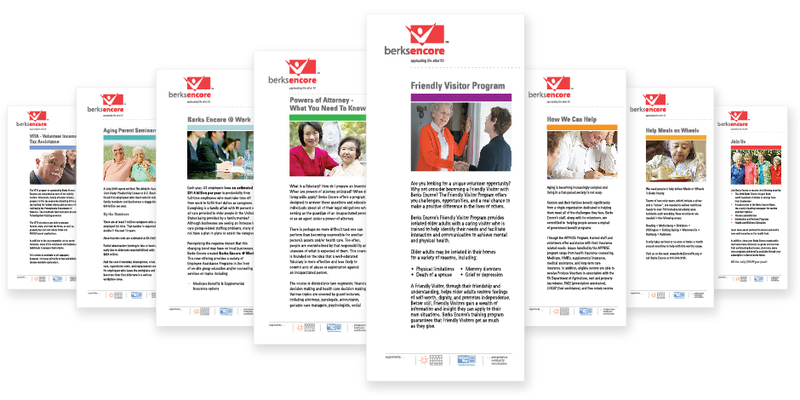 Branding implementation included a range of informational cards for Berks Encore. Helping senior citizens for more than fifty years, the original Berks County Senior Citizens Council brand used an assortment of mismatched printed materials, rack cards and brochures. Different looks and little or no tie-in to the original name did not strengthen the message. The new system organized information and services, while actually consolidating printed materials and saving space and printing. The structured Berks Encore template is easily expanded to include additional information. Development also included signage for the headquarters and five centers throughout Berks County, along with a logo for their BeFit BeWell program. Is your nonprofit brand reaching out to potential donors? Contact us, we’d like to help. CLIENT NOTES: Berks Encore is a nonprofit organization located in Reading, PA with additional centers in Birdsboro, Fleetwood, Mifflin, Strausstown and Wernersville. Berks Encore, supported by the Berks County Office of Aging, United Way and generous community contributions, provides services such as advocacy, education, evening programs, healthy living and referrals.